Sasikumar Mukund has come up with an impressive performance in the ongoing Chennai Open ATP Challenger to outplay his German counterpart Sebastian Fanselow 6-3, 6-1 in the second round. Meanwhile, Sumit Nagal continued his cold streak as he lost to Korea’s eighth-seed Duckhee Lee 3-6, 4-6. In the ongoing Chennai Open ATP Challenger Tennis Tournament, two of India's young guns have had completely different performances. 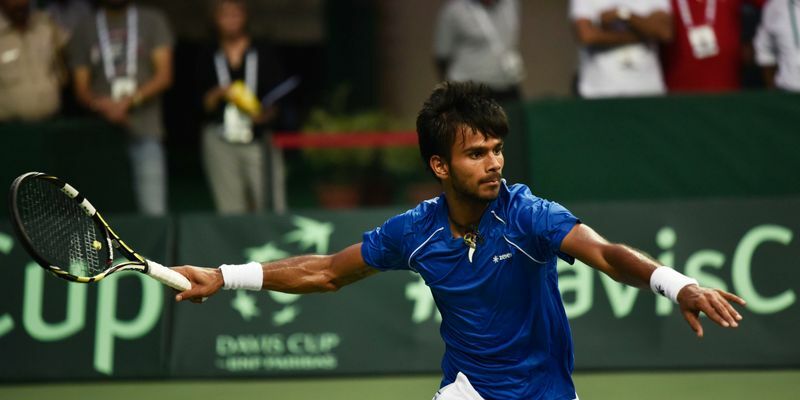 If on one side, there is Sasikumar Mukund, who had success against his German rival Sebastian Fanselow, then on the other side, it was Sumit Nagal who was trying to get his rhythm back after a moderate 2018, lost to Korea's Duckhee Lee in two straight sets by 3-6,4-6. Mukund started strongly and held serve with an ace. After 2-2, Mukund won 12 of the remaining 13 points to go ahead with a 5-2 score. Although the German held onto his serve after great difficulty to claw back to 3-5. Mukund then saved the only break point against him with a superb ace and thereafter the next two points and went on to clinch the first set 6-3. The Indian was at his very best in the second set, securing a break in the first game and began to find the good lines with quite a greater regularity. Fanselow held serve in the third game but Mukund was on a roll and won 16 of the remaining 20 points to record a straight win under his belt. He will next play third-seeded Mohamed Safwat of Egypt in the next round. Safwat defeated Andrea Pellegrino of Italy 6-3, 7-5 in a clinical display. In another encounter, former Wimbledon junior doubles champion Nagal struggled to find his serving rhythm and Lee, who was a semifinalist here last year, won the first set by 6-3. In the second set, the duo traded one service break each. At 4-4, Lee held serve and broke Nagal in the tenth game with ease to move into the next round. In another match, Khelo India Games Under-21 winner Manish Sureshkumar, who was a wild card entrant, found the going tough against Brydan Klein of Britain and went down in straight sets. In the doubles, Italian pair of Gianluca Mager and Andrea Pellegrino shocked the third-seeded Indian duo of Arjun Khade and Saketh Myneni in straight sets. Top-seeded Prajnesh Gunneswaran will open his campaign against Daniel Altmaier of Germany while 11th-seed Saketh Myneni will face compatriot Vijay Sundar Prashanth. Arjun Khade will face 13th-seed Jose Hernandez-Fernandez of the Dominican Republic.